While installing a solar panel at home and using the sun’s juice to power up your television might sound like a great idea, the task of setting up a system like this isn’t always as simple. Often, people interested in solar energy are faced with hurdles like angled roofs and improperly structured terraces that are a hostile environment for solar panels. 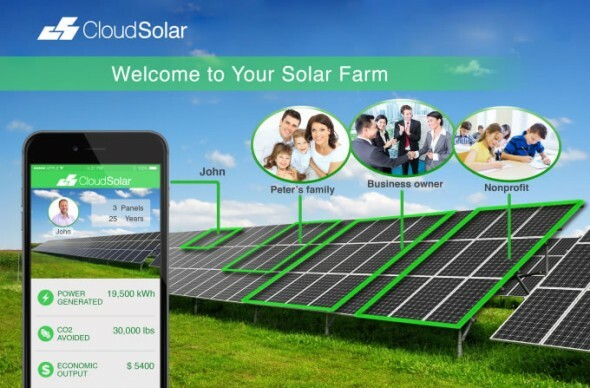 To make things easier, a Boston-based startup called CloudSolar has come up with a solution! Like every good thing that comes to an end, bicycles too have a lifespan, post which, they’re meant to be scrapped. However, there’s a greener and more environment friendly way to put to rest your old bicycle. 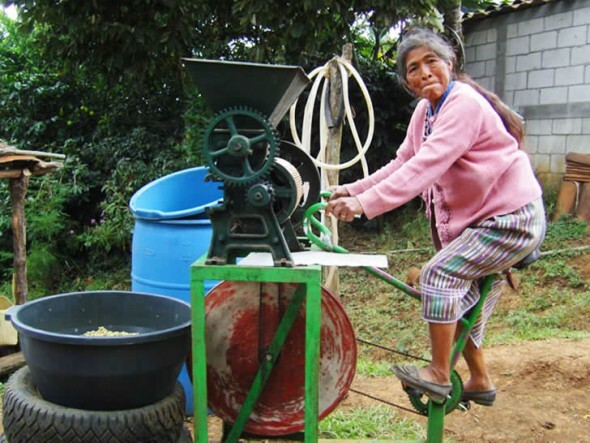 Guatemalan NGO Maya Pedal has come up with an innovative way to turn old bicycles into useful contraptions. The NGO transforms old retired bicycles into pedal-powered machines. These include functional water pumps, blenders and tile makers too! 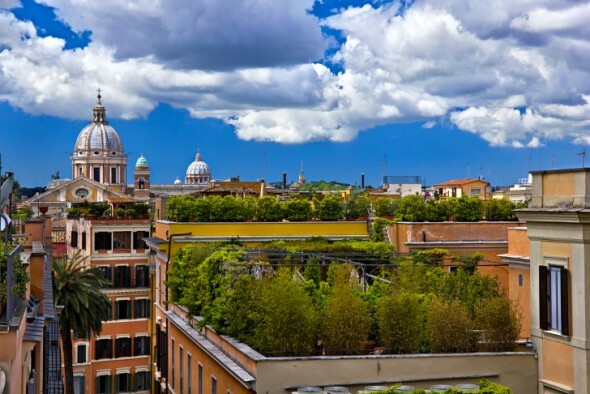 In an effort to increase its energy-efficiency quotient, France has just passed a law that requires every new building constructed in a commercial area to either sport solar panels or a green roof! A move like this will help the nation boost its solar energy production, while decreasing its complete reliance on polluting energy sources. France has been left behind in green energy generation and this law will also help change skylines and make the country environment friendly! There’s an ocean full of opportunities out there, literally, and the Carnegie Perth Wave Energy Project in Perth is looking to make the best use of it all! Just off the coast of Perth in Western Australia, CETO technologies will generate energy from the swell and convert it into usable electricity. At the same time, the project will also generate desalinated water, fit for human use. 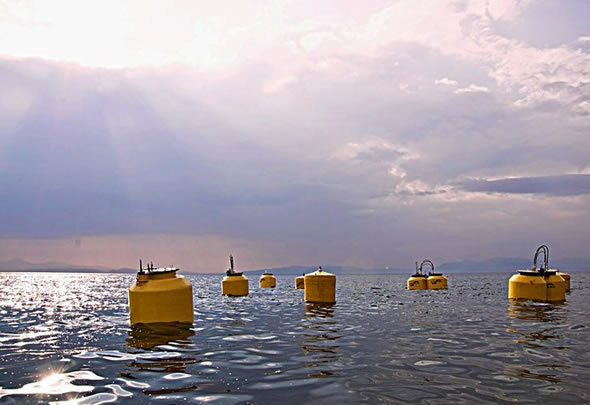 Three submerged 240-kilowatt buoys will be hooked onto the seabed with hydraulic water pumps. As the system bobs up and down with the waves, pressurized water is pushed through power turbines, generating electricity. One of the very few stressful situations that electric vehicle owners face today is range anxiety. People looking to invest in EVs or currently owning one do spend hours of time imagining what it’d be like to be stranded on a lonely highway, far away from an EV charging station. A few unlucky souls have faced nightmarish situations like these in the past too. 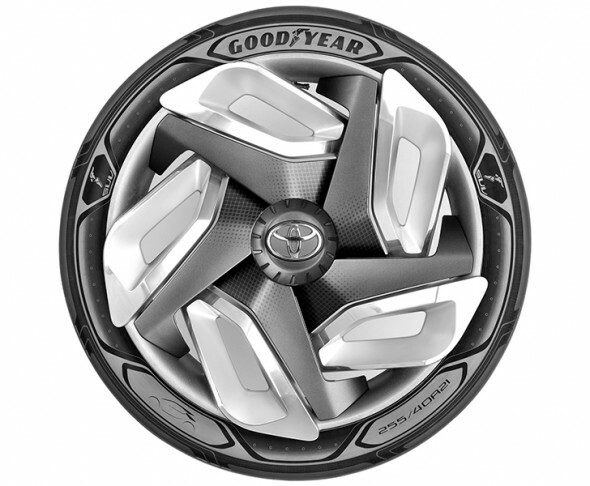 However, Goodyear is looking to change this scenario and has shown-off a new heat-gathering, electricity-generating tire concept at the 2015 Geneva International Auto Show! The future is bound to be sustainable and for that, we’ve got to make moves in the present. That’s just what the Dutch Windwheel Corporation has drawn up. 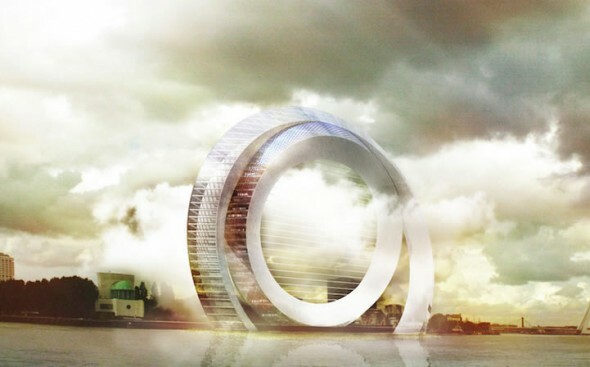 In an attempt to visualize the future of Rotterdam, the institution has crafted a beautiful mashup between a wind turbine and a dwelling space. It’s made of steel and glass and is decked with three inset circles, built to perform different functions. The outer ring rotates to treat visitors to spectacular landscapes, the middle one hosts 72 stationary apartments for residents within the building while the inner circle is the actual wind turbine. The ingenious waste management system ensures that the waste produced by residents is converted to biogas while the rainwater harvesting and recycling processes will keep everyone well hydrated. 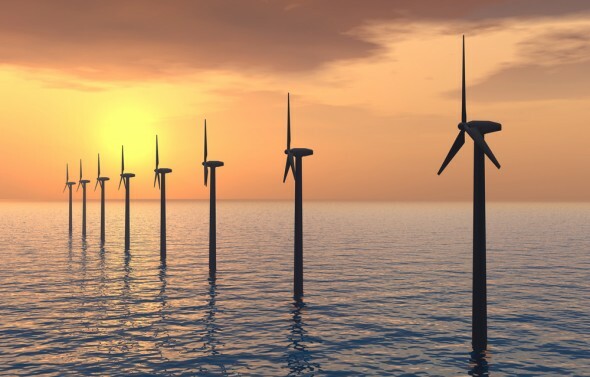 London will soon have world’s biggest offshore farm off the Yorkshire coast. The Dogger Bank Creyke Beck Project will have an array of up to 400 turbines 80 miles of the Yorkshire coast. The project will cover 430 square miles will generate 2.4 gigawatts which is enough electricity to power about 2 million homes. The cost of the UK’s biggest offshore farm will be £6bn to £8bn, and it is likely to fulfil 2.5 percent of the country’s electricity needs. According to the government the project will also create 900 jobs near Yorkshire and Humberside. Dogger was chosen as a location for offshore wind farm because of its shallow seabed which is about only 30 metres deep. It is easier to lay foundations and construct large turbines; however, any company has not yet started the work. Depending completely on fossil fuels to power up the earth isn’t such a great idea anymore, not in the current circumstances of extreme pollution and a degrading environment. Instead, the only way out of this big muddle we’ve all got ourselves into, is renewable energy. Albatern, Scotland’s wave energy company, is looking at better ways to powering up, using a new system called the WaveNET. 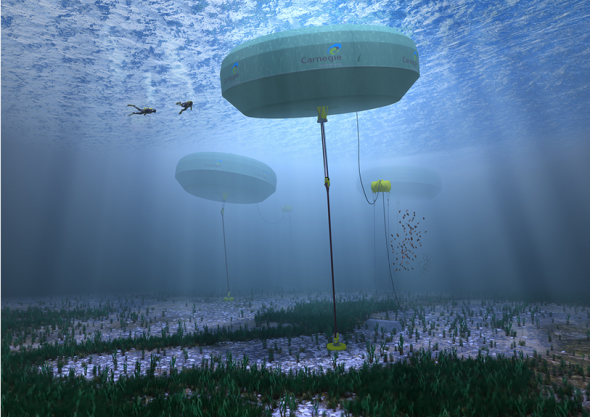 This one uses an array of floating generators, nicknamed Squids, which harvest energy from rising and falling waves. We’ve always advocated the use of bicycles, given the fact that these two-wheeled contraptions promise to take you from to your destination without spewing venomous clouds of carbon in the air. 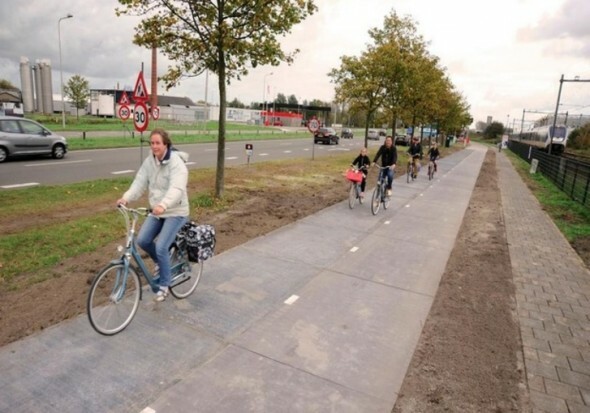 To make cycling even more greener than it already is, the Netherlands is welcoming home the world’s first solar cycle path, one that’ll soak in the energy of the sun to generate electricity. 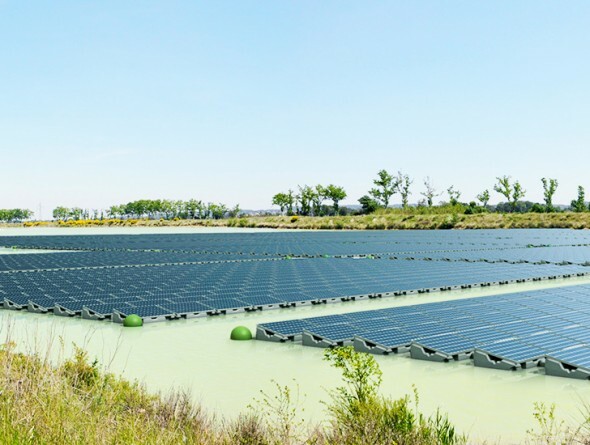 Berkshire now plays home to UK’s first floating solar power farm!